Personalised pet towel that can be personalised with a name and features a paw print motif. 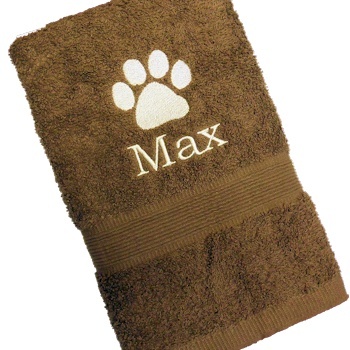 Personalised pet towel that can be personalised with a name and features a paw print motif. Useful 49cm by 90cm hand towel size or 75cm by 125cm bath towel size. Made from 100% cotton 500gsm which is easy to wash and dry. Choose the size and colour towel you want. Amys Gifts will personalise a pets name on this in a embroidery thread colour and font style of your choice. If you would like an embroidered name please fill in the options box and remember to check your spelling. Handy gift for all dog, cat and animal lovers. Size: 49x90cm hand towel or 75x125cm bath towel.